The search for good pasteis de nata continues! If you’re still unfamiliar with these delicious Portuguese pastries, you must come to Forcado as quickly as possible to give them a try. 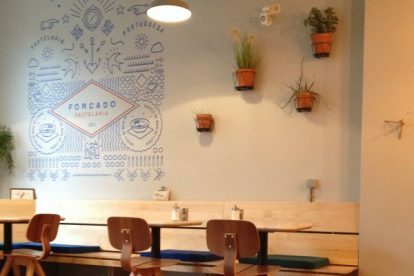 Forcado started life as a small bakery that sold pastries to other Portuguese cafés in the area. Now it has moved a few doors down and expanded into a full bakery and café. Forcado offers the traditional pastel de nata, as you would find in Lisbon, but also innovates with the concept and has a number of different flavours, such as coffee or orange. I particularly recommend the coffee one. The café itself is nicely decorated, with a mixture of contemporary Portuguese and Scandinavian design, which makes it a pleasant place to drink a coffee with some friends or to sit and read. Alternatively, you can come in and order the pastries to take home. They also sell homemade jams and various gastronomic products from Portugal.